Published: July 6, 2016 at 12:06 p.m. Updated: July 6, 2016 at 01:19 p.m.
College Football 24/7's "16 for '16" series continues with a look at 16 wide receivers who we'd most want when the time comes to compete for a jump ball. We've assembled many of the game's most productive big men at the position -- they average about 6-foot-4 and 214 pounds, more than enough to create a size mismatch with even the biggest of cornerbacks -- but there are also some impressive leapers here as well. With spread offenses creating single coverage for some of these playes, fades and lobs are an easy call for offensive coordinators. Note: Heights and weights listed below are school measurements. Here we'll indulge in a pick based more on projection than production. Yes, Brown is less proven than anyone listed here from an experience standpoint. He missed all of last season with a leg fracture and caught only one pass as a freshman in 2014. But you'd better believe J.T. Barrett will throw his way plenty this fall. The buzz on Brown among Buckeyes players was palpable during fall practice last year prior to a season-ending injury and he had carved out a significant role in a receiving corps that included eventual draft picks Michael Thomas and Braxton Miller. The decks have been cleared for a new WR1 in Columbus, and Brown is a physical player who has the body to play well in traffic. "He's a big, strong buck who can catch the ball. 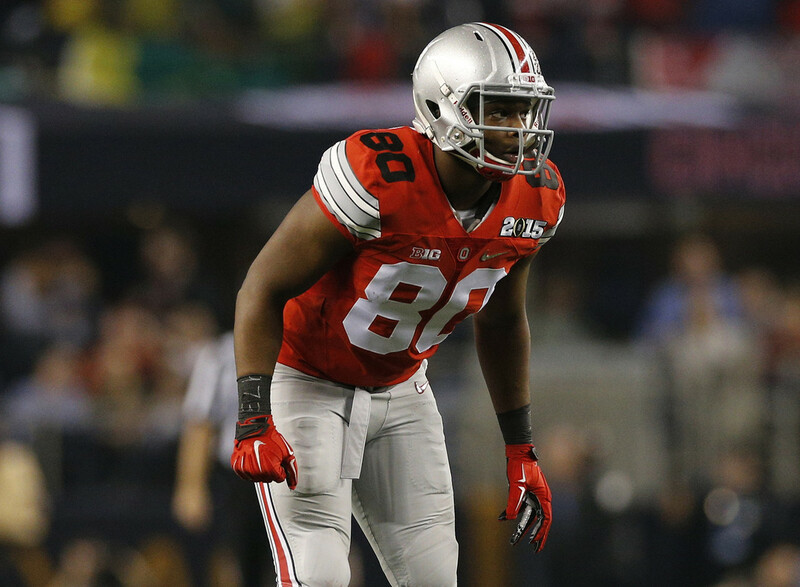 He is a tough dude," said OSU cornerbacks coach Kerry Coombs during spring practice. Baker flashed last year with some spectacular catches, but also had issues with drops at times. Still, his combination of leaping ability and physical play makes him a tough matchup and UK's No. 1 target. As for his potential, consider this: UK receivers coach Lamar Thomas has compared him to 2015 first-round pick DeVante Parker. "He's big. He has great body control, can make plays in the air," Thomas said. The biggest of all the receivers listed here, Maulhardt caught 57 passes with a team-high eight touchdowns last season, and did it relying much more on size than speed. Last year's Wyoming QB, Cameron Coffman, on Maulhardt: "... he's still going to come down with it just with his wingspan, his long arms and things like that. He's really a mismatch for smaller defense backs who cover him." An interesting note on Maulhardt: He once broke a California state high school record with 28 catches in a single game. Among returning Pac-12 receivers who have proven productive, Villamin is by far the biggest. "It's hard to overthrow (him) with his height," offensive coordinator Dave Baldwin told the Statesman Journal last year. Villamin has caught 78 passes in his career and can shield defenders from the ball with a tight end-like frame. At times last year, watching 6-foot-7 QB Nate Sudfeld throw to Cobbs looked more like a game of keepaway than football. Naturally, Cobbs was a standout basketball player in high school and brings some of those instincts to the football field. He emerged from total obscurity to become one of the top receivers in the Big Ten last year, making 60 catches for 1,035 yards. After transferring from UAB when the school's football program was shut down, Staples emerged as Louisville's top receiver last year. Along with being 6-4, he's reportedly registered a 40.5-inch vertical leap in testing since joining the Cardinals, according to the Louisville Courier-Journal. That would have tied Staples for third place with Baylor's Corey Coleman among wide receivers at the 2016 NFL Scouting Combine. QB Lamar Jackson couldn't ask for a better choice for the fade route in the red zone. The former quarterback who switched positions early in his college career has steadily improved his production from year to year, leading to a 52-741-4 season in 2015. He drew national attention last year with one of the most spectacular catches of the college season against Texas A&M. Nevada coach Brian Polian has described Henderson's hands as "gigantic," and former Nevada OC Nick Rolovich once summed up Henderson this way: "He tracks the ball real well. He's open when he's not open. When other guys are covered man-to-man, they're not as open as he is. He's 6-5, 235 pounds, he's really physical, he's fast enough and he bodies people up like he's rebounding." Golladay exploded onto the MAC scene as a redshirt freshman last year, introducing himself to the league by way of 73 catches for 1,129 yards and 10 touchdowns. And as if his height (6-4) isn't enough of a problem for opposing defensive backs, Golladay also has some highly impressive hops. Kurtz made an immediate impact in his season debut with a 5-for-123 performance against Nebraska. For a good example of Kurtz's ball skills, see this touchdown catch at the 1:25 mark of these highlights from a win over Cincinnati. Said Kurtz: "With a big guy you can be covered, but at the same time, (if the) quarterback puts it in the right spot, you're still open." OK, so the former five-star recruit hasn't developed into the Aggies' No. 1 receiver (time to stop the "next Mike Evans" hype), but in a deep and talented receiving corps, there's nobody on the roster we'd rather lob one to. Seals-Jones has caught 40-plus passes in each of the past two seasons and is a most physical presence. Not surprisingly, he was a prolific high school basketball player, reportedly averaging 15.2 rebounds per game as a prep junior. He's a wide receiver in a tight end's body, and on a fade route, he's usually too much to handle for defensive backs. Washington is the shortest player listed here, but he has a knack for timing and high-pointing the ball to make contested catches. OSU receivers coach Kasey Dunn has said there was more basketball video than football video available on Washington during his recruitment, on which he was "360-jamming the basketball." Washington had a breakout season last year with 53 catches for 1,087 yards and 10 touchdowns. This from NFL Media analyst Lance Zierlein: "Washington is a well-built, explosive leaper who wins jump balls." The second-team All-Big 12 pick caught 56 passes last year. He brings blocking and prolific return skills to the table (19.5 yards per punt return), but it's his ability to make the contested catch that gives the ISU offense a frustrating dimension for opposing defenses. Cyclones assistant coach Jim Hofher told the Des Moines Register: "He doesn't have an S (like Superman) on his shirt but he's really good. He's really a difficult matchup I would think for most players that he'll face." Former Trojans QB Cody Kessler got a lot of mileage out of Smith-Schuster's ball skills when he drew single coverage last year, throwing the ball up and letting his big target outwork smaller defenders for big gains. He ended up catching 89 passes, more than double that of USC's No. 2 receiver. NFL Media analyst Daniel Jeremiah recently compared him to Arizona Cardinals WR Michael Floyd, writing that Smith-Schuster "uses his upper-body strength to power through press coverage and knows how to wall off defenders down the field. He flashes the ability to make special catches and he tracks the ball naturally." A favorite of coach Jim Harbaugh's for his toughness and leadership, Chesson returns as the Wolverines' No. 1 receiver. He ran a lot of routes that called for contested catches in the middle of the field last year, and responded with a significant increase in production over the second half of the season. An NFC scout told College Football 24/7 that Chesson's "catch radius" -- a receiver's range to grab a throw -- is outstanding. Williams returns to the Clemson lineup this fall from a neck injury that ended his season in the Tigers' first game last year. Williams doesn't have to put his jump-ball skills to use as often as most receivers his size, because he also has the speed to sprint past cornerbacks and make an easier catch. But Williams is one whom Tigers QB Deshaun Watson can afford to underthrow on a deep ball. NFL Media analyst Lance Zierlein recently wrote that Williams "can be a big-time playmaker when the 50-50 ball comes his way." As a sophomore in 2014, Williams pulled in 1,030 receiving yards on 57 catches. Dupre has very good size at 6-foot-3, but in the red zone, he plays like he's 6-5. "He's a guy with real big hands and real long arms, and he's real athletic," fellow receiver Travin Dural said before last season. "He can make those hard catches look easy." Dupre is a former Louisiana state high jump champion, and brought a reputation for overmatching smaller cornerbacks to LSU as a five-star recruit. That has translated to the SEC: Dupre led Tigers receivers in catches (43), yards (698) and TDs (6) last year.